"I love Profit Bandit! Without it, I wouldn't have an Amazon business! Profit Bandit makes sure I turn a profit on everything I sell!" Unlimited scanning on Android and iPhone, only $9.99 per month. Scan any barcode in 5 seconds. Use a bluetooth scanner (with optional in-app purchase) for even faster scanning. Live lookup using Amazon’s API ensures you have up-to-date offer and pricing data, every time you scan. An offer highlighted in a brown box lets you know if you’ll be competing against Amazon themselves. An asterisk next to an offer shows you who has the Buy Box. It’s not always the lowest price! Over 15 factors, including weight, Amazon fees, your cost of goods, shipping rates and more go into calculating your estimated Amazon profit. Profit Bandit warns you when an item you scan can’t be listed on Amazon (you must be signed in to Amazon to enable this feature). See if you’ve got a hot item on your hands. Search on CamelCamelCamel and review historical Sales Rank and price data, too! Tap your estimated profit and see how it was calculated, down to the penny. Hover over the bulls-eye icons on the image to your right to see an explanation of Profit Bandit’s top features. Want to grow your Amazon business? SellerEngine has the tools and experience to help Amazon sellers of all sizes take their business to the next level. See how our repricing tools and professional services can help you. Whether you’re hunting for inventory at trade shows, big-box retail stores, library sales, thrift shops or anywhere else, Profit Bandit will become the Amazon assistant you can’t live without. 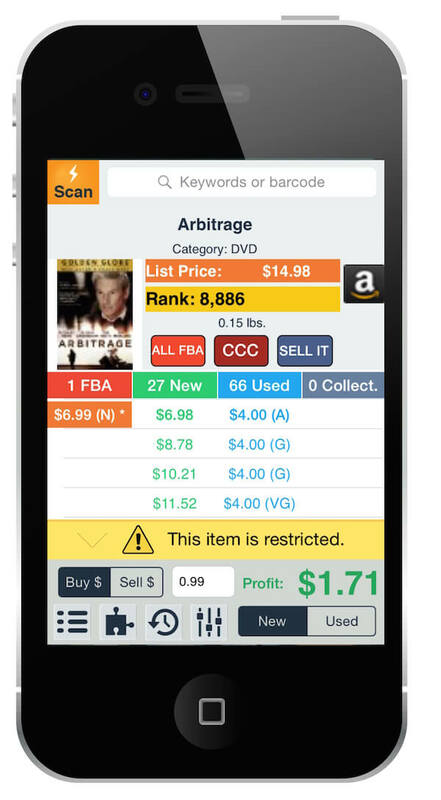 Start using the #1 mobile Amazon seller software on the market today. Click here for the Profit Bandit User Guide for iPhone. Click here for the Profit Bandit User Guide for Android.